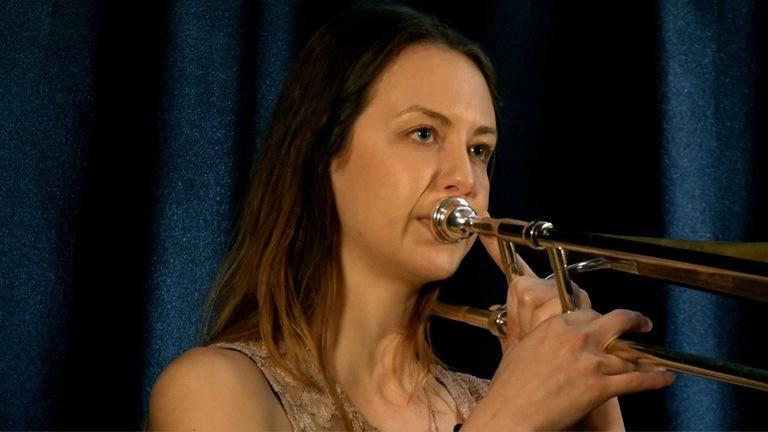 In this thorough course, learn from Manhattan School of Music alumna and Lessonface teacher Natalie Cressman the basics of how to play the trombone. From the first steps as how to produce sound to learning a song by Natalie herself. Designed and taught by Natalie Cressman, this course is recommended for beginner musicians or accomplished practitioners of other instruments. Steadily evolving in many directions, the 25-year-old Cressman has already put down deep roots in several overlapping scenes. A prodigiously talented New York City-based trombonist, she’s spent the past seven years touring the jam band circuit as a horn player and vocalist with Phish's Trey Anastasio (and recently played with Phish at Madison Square Garden). Deeply versed in Latin jazz, post-bop, pop, and Brazilian music, she tapped the interlaced traditions on her first two solo albums, 2012’s Unfolding and 2014’s Turn the Sea. Now teaching with Lessonface she can conciliate her students with her busy touring schedule. You can check out her Lessonface profile here. You may also learn more and save by bundling in two 30-minute private online lessons with Natalie, essentially getting the course for free. This course was recorded April 2018 at the Lessonface studio in the West Village, NYC.